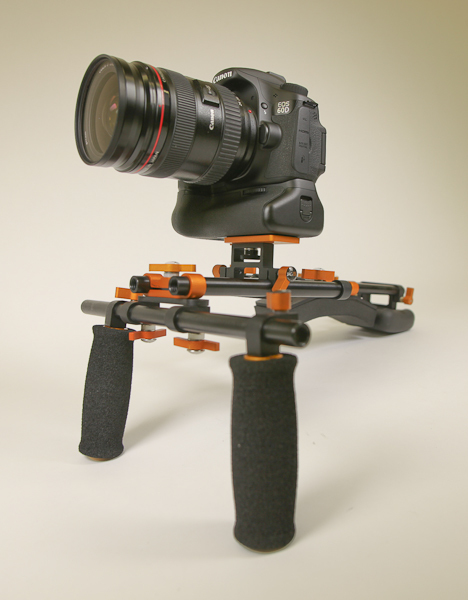 It's Jag35's DSLR Full Shoulder Rig. Jag35.com long ago, was a DIY Video website now, and has now grown into a company focusing more on actually manufacturing and reselling affordable and professional video equipment. 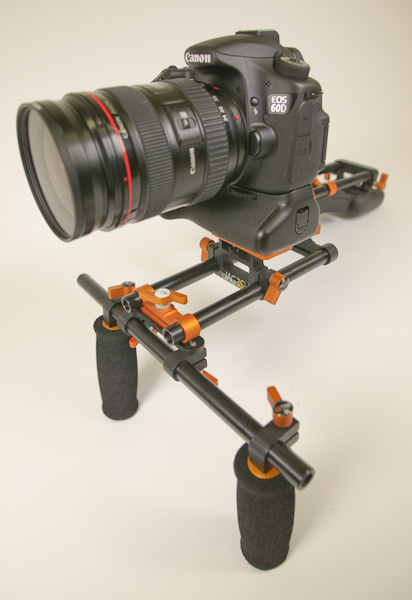 With the trend, there's no doubt that they have a full line of DSLR related equipment from Shoudler Rigs, to Follow Focus systems, LCD view Finders, Cages, Monitors, Batteries, and more. 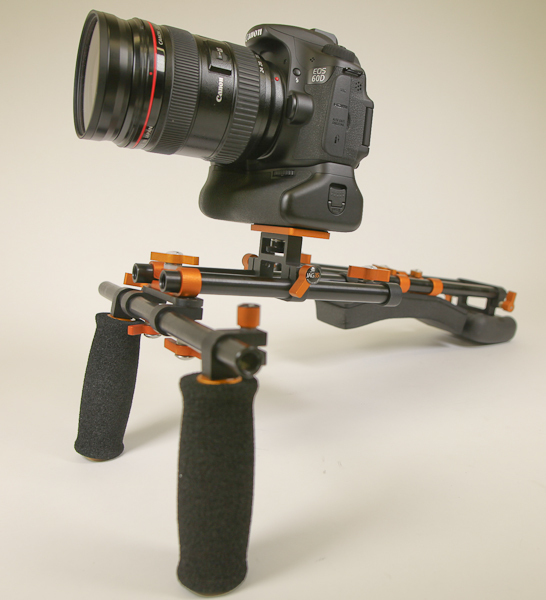 This Jag35 Full DSLR Shoulder Rig comes with industry standard 15mm rods to expand with other accessories. 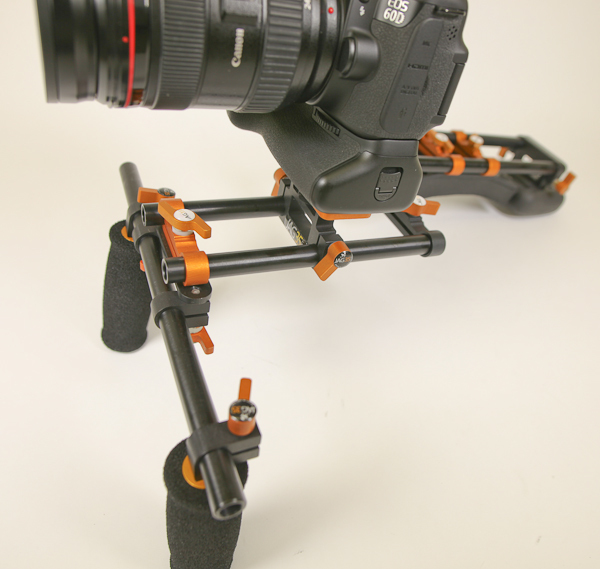 The rig comes with a simple configuration of clamps, handles, contoured shoulder pad, an offset design for DSLR's, and counter weight for balance and extra stability. 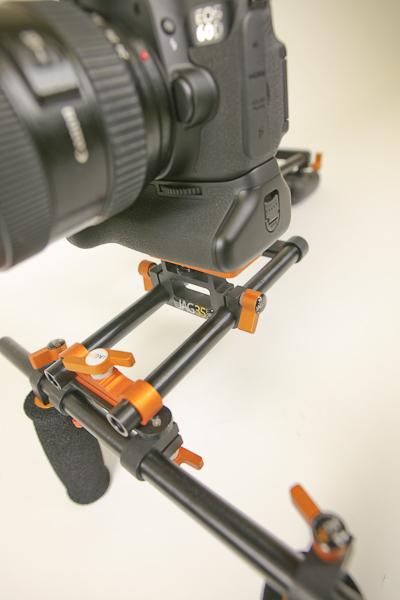 Like most affordable DSLR rigs, it was designed to have the most important features you'll need for a stable shoot. Wide spread handles (adjustable of course), comfortable shoulder padding, and counter weight. It's not a bad looking rig, and it's an all aluminum build, but unlike the top players - this one leaves off unnecessary aesthetics to keep things more affordable as a starter. What do I mean by this? Well for instance, the handles aren't anything special, but they work like handles should. If you want something more substantial, you're welcome to upgrade them from another company since the rods can accept any industry standard clamp. The counter weight is also something we've come to recognize, but that just makes it all more affordable, while still blending in with the OEM. Who needs to pay three times the price for flashy high polished stainless weights? Sometimes you just need to get the job done. I've never been a fan of the orange color, but it's not bright as it seems on the web. It's more of a metallic copper. The friends that came to see the rig actually liked the color, but hey everyone's different. I do like the extra time they put into black on black rods, a few of the rod clamps, and handles. The black is also a more matte finish than the Gini rods if you like the flat finished look. The foam padding on the shoulder rest is a full 1" thick and fairly dense to support the weight. There is quite a bit of brand recognition going on here which might not appeal to some. Every little knob and every clamp is covered with a Jag35 button like badge. I'm missing the top handle, and this is the base setup. There is a whopping (count them) "17" Jag35 Logos on this rig. I'm hoping that didn't add to additional costs in any way, i'd rather save a few bucks than to have so many logos stuck everywhere you turn. If you're looking for something even more affordable, Jag35 also offers another starter rig that you can build on, called the FieldRunner. Posted in dslr stabilizer, Equipment Reviews, Videography Gadgets. 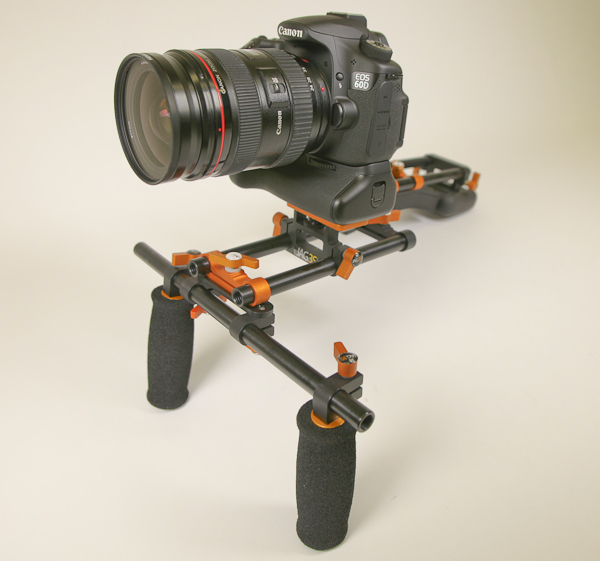 Tags: dslr rig, DSLR Shoulder Rig, field runner, jag35 shoulder rig, monitor x, review, video stabilizer on November 20, 2010 by Emm. thanks for the fast reply, do you know any other options? 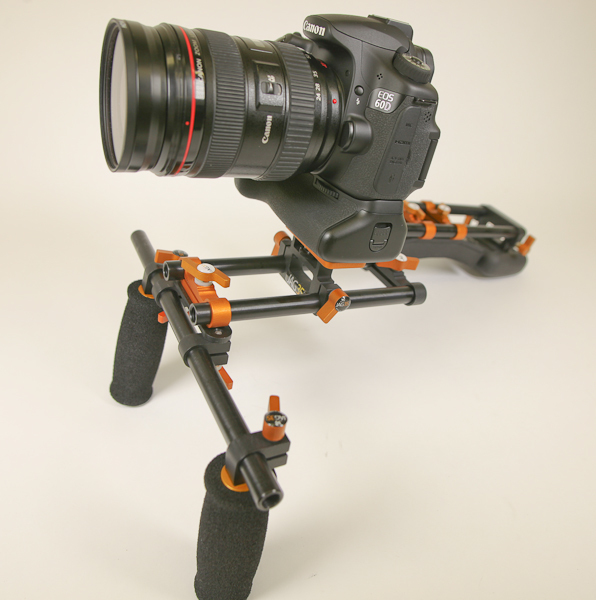 @Totink - Check out the Letus Hawk VF 3/2 aspect with Quick Release adapter. I have it and will do a review soon. hey, i see theres a canon 60d in the first picture. and another camera with an LCD viewfinder at the bottom. Do you know anything about an LCD viewfinder for the canon 60D without losing the swivel lens capability? I for one am quite happy Emm put this up. I didn't know about this rig, and it is one of the cheaper ones out there. Plus, Emm's review are always a good thing. Of course there are DIY solutions out there, but there always are, but the 300$ filed runner is pretty good value IMO. Looks like the really basic Field Runner model comes in at $279 which is better. But then they charge an additional $30 for a top handle! @M, I agree it is over-priced. This looks like an easily achieved DIY system just from collecting info on the cheesycam site you could make something to this effect at a fraction of the cost. Jag35 should try and be unique individuals, i remember them re-branding 'lilliput' monitors and just pasting their logo on top. These cowboys are really out of their depth!! I have to agree. When reading the article I thought this thing would come in at around $250. Clicked on the link and saw one with the top piece for $650 or so? I just don't see how something like this would cost that much even with the extra mark up for profit. Admittedly though I know nothing about manufacturing or efficiencies of scale. @Pao - yes, it would be compatible. While this thing is considerably cheaper than the uber-expensive name brand rigs, it's still wildy over priced. Doesn't seem worthy of a Cheesycam appearance at all. One of my friend has the Field Runner. It's pretty solid, looks great, clamps are strong but I find the handles way too small an too tight and it's a real pain in the "beep" to install a decent follow focus. it should be compatible w/ the ikan f3 ff right? looks like it should be...?